Tickets are £10 for adults, concessions are free, and can be booked here. *Please note that if you choose a concession ticket, you still need to select a payment option but you will NOT be charged for your ticket. The winner of multiple international piano competitions, Chenyin Li is internationally acknowledged as one of the most exciting and sought-after musicians of her generation. Her career was launched after winning the 6th Scottish International Piano Competition in Glasgow, as well as being the first prizewinner of the Campillos International Piano Competition, Dudley International Piano Competition and the European Beethoven Gold Medal. She has been described as a “gritty, fiery and athletic pianist, backed by a strong technique arsenal” (The Daily Telegraph), and “a player of remarkable subtlety” (The Scottish Herald), who “understands the original intentions of the composers as well as bringing her own individual interpretation which invests the music with a new life” (National Business Review). Chenyin has appeared as soloist with several prestigious orchestras around the world, including the Royal Scottish Symphony Orchestra, the China Symphony Orchestra and the Aarhus Symphony Orchestra (Denmark) to name a few, and has collaborated with many celebrated conductors such as James Loughran and Alexander Lazarev. Chenyin has given recitals at many prestigious venues both abroad and in the UK, including the Royal Festival Hall, Wigmore Hall, Purcell Room, Queen Elizabeth Hall and Royal Concert Hall (Glasgow) and she has participated in several International Music Festivals. 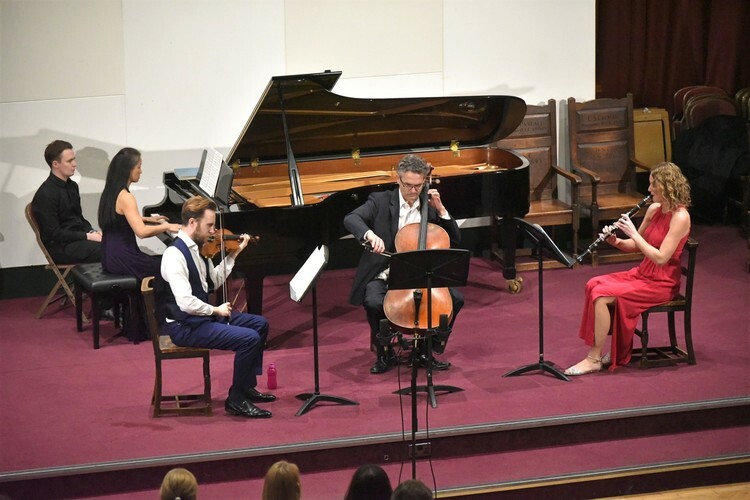 The second Hanbury Wealth Recital this academic year, featuring the Vela Ensemble took place on Tuesday, 5th March in the Memorial Hall. I was delighted to be able to hear perform in public my clarinet teacher who is Charys Green, one of the members of the ensemble. All award winning members of the group had impressive backgrounds as professional performers and had performed in a variety of famous venues such as the Royal Opera House. Some had played with prestigious orchestras, such as the Royal Philharmonic, and all had toured all over the world as recitalists. There was an exciting atmosphere in the Memorial Hall as the concert commenced with a four movement piece by Darius Milhaud, Suite Op. 157b for violin, clarinet and piano. 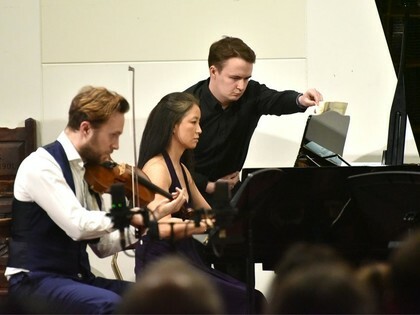 Alex Redington (violin), Charys Green (clarinet) and Siu Chui Li (piano) showed their expertise in solo performance and sensitive ensemble playing. The next piece by Felix Mendelssohn, Trio No. 1 Op. 49 in D Minor also featured three performers. This time, Tim Steggals (cello) replaced Charys Green on the stage. Each part was beautifully executed. In the first movement, Tim Steggals’ lilting cello introduced each lyrical flowing theme. 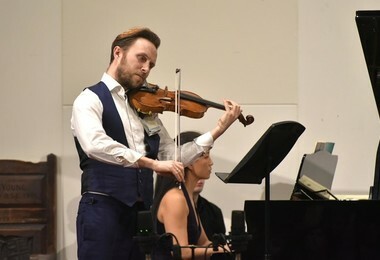 Siu Chui Li’s piano part was very expressive in the second movement and Alex Redington’s violin playing was very moving. After the short interval we heard Brahms’ Trio Op. 114 in A Minor for clarinet, cello and piano. Charys Green’s clarinet played a thrilling role in this piece which depicted contrasting emotions from the sad first movement to the waltz like movement of the third and the energetic gypsy style of the final movement. The final piece, Creation, was written by living Spanish composer, Oscar Navarro. It had been chosen for its technical difficulty and its instrumentation which featured all four members of the ensemble. This was an exhilarating finale and many people share the opinion that it was the highlight of the evening. It was highly exciting from start to finish and each performer was able to display their virtuosity in the challenging piece. 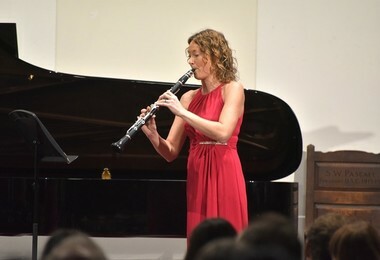 The audience gave long, rapturous applause and I left the concert hall feeling very inspired and determined to practise the clarinet much more!